Author(s): Tahereh Farkhondeh, Saeed Samarghandian. Department of Basic Medical Sciences, Neyshabur University of Medical Sciences, Neyshabur, Iran. Curcumin, the major phenolic compound in turmeric, shows preventive effects in various diseases. Curcumin is commonly found in rhizome of the Curcuma species and traditionally used in herbal medicine. Numeros studies has indicated that curcumin posses protective effects against toxic agents in various systems including cardiovascular. This study found that curcumin may be effective in cardiovascular diseases induced by toxic agents including Streptozotocin, Doxorubicin, Cyclosporin A, Methotrexate, Isoproterenol, Cadmium, Diesel exhaust particle, Nicotine, Hydrogen peroxide, and tert- Butyl hydroperoxide. However, due to the lake of information on human, further studies are needed to determine the efficacy of curcumin as an antidote agent. The present study aimed to critically review the recent literature data from that regarding the protective effects of curcumin against agents-induced cardiovascular toxicity. Keywords: Antioxidant, cardiovascular, curcumin, toxic agents. Affiliation:Department of Basic Medical Sciences, Neyshabur University of Medical Sciences, Neyshabur, Iran. Keywords:Antioxidant, cardiovascular, curcumin, toxic agents. Abstract:Curcumin, the major phenolic compound in turmeric, shows preventive effects in various diseases. Curcumin is commonly found in rhizome of the Curcuma species and traditionally used in herbal medicine. Numeros studies has indicated that curcumin posses protective effects against toxic agents in various systems including cardiovascular. 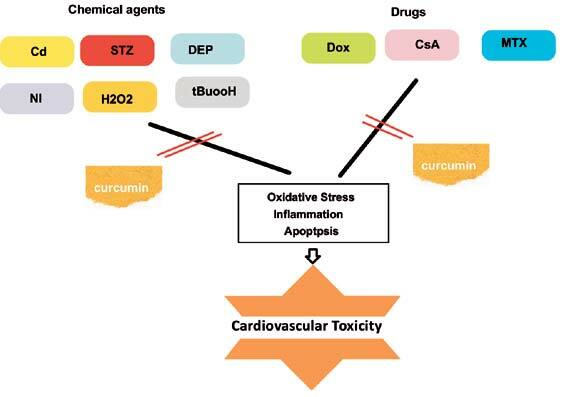 This study found that curcumin may be effective in cardiovascular diseases induced by toxic agents including Streptozotocin, Doxorubicin, Cyclosporin A, Methotrexate, Isoproterenol, Cadmium, Diesel exhaust particle, Nicotine, Hydrogen peroxide, and tert- Butyl hydroperoxide. However, due to the lake of information on human, further studies are needed to determine the efficacy of curcumin as an antidote agent. The present study aimed to critically review the recent literature data from that regarding the protective effects of curcumin against agents-induced cardiovascular toxicity. Optimizing the Management of Uncontrolled Hypertension: What do Triple Fixed-Dose Drug Combinations Add?